A hundred years in the making! The State Capitol Building Hosts over 100 outdoor events each year resulting in many street closures that adversely affect local traffic. 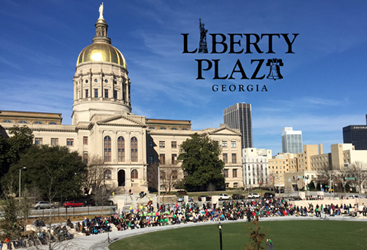 “Liberty Plaza” now becomes the major focal point for large groups that hold public rallies and assemblies both during and between legislative sessions. The public plaza is large enough to accommodate over 3,000 visitors and is located across from the Georgia State Capitol. The Liberty Bell and the Statue of Liberty replicas previously located on the Capitol grounds were relocated to prominent locations in the new Plaza. Use the Capitol Hill Event Management System to request the use of indoor or outdoor public areas of the Capitol (including Liberty Plaza) for events or exhibits. Liberty Plaza is designated as the Capitol public area for all outdoor events or exhibits. Guidelines for its use are outlined in section 2.5 on page 6. Concepts, model views and photographs.